Palestinian President Mahmoud Abbas, making his first trip to Russia since Hamas took over the Gaza Strip, planned to meet Monday with Russian Foreign Minister Sergey Lavrov. 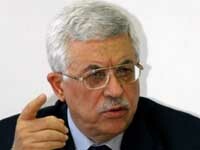 Abbas was also slated to meet with President Vladimir Putin during his three-day trip. The ITAR-Tass news agency quoted Abbas as saying that, during his visit, he intended to "discuss all the pressing problems, especially as many such problems have amassed.... Our friendship with Russia is rooted in history, and we will preserve and strengthen this relationship." The visit is the first since the June takeover of the Gaza Strip by Hamas amid bloody fighting. Abbas and a new government he has named control over the West Bank. Russia is a member of the Quartet of Mideast negotiators, which also comprises the United States, the United Nations and the European Union. Abbas last met with Putin in Russia in May 2006.